The usual Friday night was different yet again, instead of the Smiths, we went to the Hope and Anchor, same village different pub. 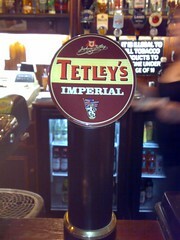 The Hope and Anchor was very busy (we are not used to that) but we did get good service and we had to drink lovely Tetley's, Imperial. I do not usually have a bad head on Saturday morning but today I do, it could be the Imperial or it could be the other beers I had when we got home. We were up late (late for us anyway), watching comic relief (red nose day) and drinking. 4.3% dark brown with a good head, roast malt aroma and a fruity roast malt taste, this beer is a lot better than other reviewers argue and I like it.